Born on September 28, 1962 in Spruce Grove, Alberta, Grant Fuhr would become one of National Hockey League’s greatest goaltenders of all time, playing on five Stanley Cup champion teams over twenty seasons (1981-2000) and earning induction into the Hockey Hall of Fame in 2003. The future Hall of Famer first began drawing attention as a teenager while playing in goal for the Victoria Cougars of the Western Hockey League, compiling an amazing 78-21-1 record for the junior circuit club, leading to his first round selection (and eighth overall) in the NHL’s 1981 entry draft by his “hometown” team, the Edmonton Oilers. His first few seasons with the Oilers was spent splitting goaltending duties with long-time veteran Andy Moog, but when the all-important Stanley Cup playoffs began, more often than not, Grant Fuhr was tabbed as the starter by Oiler head coach Glen Sather. Grant Fuhr spent parts of ten seasons with Edmonton (1981-1991), appearing in 423 regular season games, as well as 112 playoff games. His regular season record with the Oilers was 228-117-54 while his Edmonton playoff record was 74-32. Among the NHL’s all-time goaltending statistics, Grant Fuhr’s name is prominently featured, ranking ninth in games played (868), ninth in games won (403), eleventh in minutes in goal (48,945), and second in assists (46). Grant Fuhr also holds several all-time NHL records, including the most assists by a goaltender in a single season with 14 in 1983-84, most games in goal in a single season with 79 in 1995-96, most consecutive appearances by a goaltender in a single season with 76 in 1996, most wins in a single postseason by a goaltender with 16 in 1988, and his 23-game undefeated streak in 1981-82 is an NHL record for a goaltender in his first season. In addition to his five Stanley Cup championships (in 1984, 1985, 1987, 1988, 1990), Grant Fuhr played in six NHL All-Star games (1982, 1984, 1985, 1986, 1988, 1989), and played on Canada Cup champions in 1984 and 1987. As for individual honors, Grant Fuhr won the coveted Vezina Trophy (awarded annually to the year’s best NHL goaltender) for his play during the 1987-88 season. In that same season (1987-88), Grant Fuhr finished second to teammate Wayne Gretzky for the distinguished Hart Trophy, signifying the league’s Most Valuable Player. 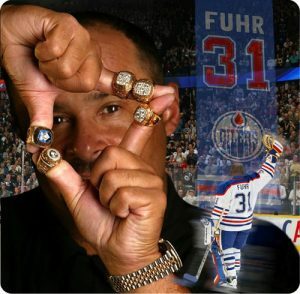 In addition to helping Edmonton to the Stanley Cup championship in the 1987-88 season, Grant Fuhr perhaps enjoyed not only his most impressive season with the Oilers (75 games, a league-leading 4,304 minutes played, a 40-24-9 record, four shutouts and a 3.43 goals against average), but his performance is considered amongst the greatest of all-time for an NHL goaltender. Grant Fuhr was undoubtedly a major component of the Edmonton dynasty between 1983-1990 when the team appeared in six Stanley Cup Finals (wiining five) and revolutionized the game with their talented, high-scoring offensive attack which simply overwhelmed their over-matched opponents. Edmonton was blessed with a young and supremely talented group of players, especially on the offensive side , and had the advantage of having the innovative mastermind Sather calling the shots. The team was also blessed with having players possessed of very high intelligence, making them even more formidable everytime they took the ice. In addition to Grant Fuhr, other members of the Oiler’s dynasty to eventually gain enshrinement into the Hockey Hall of Fame included Sather, Gretzky, right-winger Glenn Anderson, defenseman Paul Coffey, right-winger Jari Kurri and left-winger Mark Messier. The overall greatness of the 1983 through 1989 Oilers was reflected in the league’s annual All-Star Game, with no fewer than four Edmonton players earning selection to the annual affair each season, with a record nine players making the 1986 squad. It goes without saying that the decade-long dominance by Edmonton ranks as not only amongst the NHL’s more incredible achievements, but also helped them to a prominent position as amongst the greatest all-around squads of all-time. In 1991, with several key members of the dynasty having already been traded, Grant Fuhr was also traded to Toronto in a blockbuster, seven-player transaction. He spent just over a season with the Maple Leafs before being traded to Buffalo, where the now-veteran goaltender helped to mentor and develop young goalie Dominik Hasek. While splitting time between the pipes for the Sabres in 1993-94, the goaltending duo teamed up to win the William Jennings Trophy for the least goals allowed. In the 1994-95 season, Grant Fuhr was reunited with former teammate and all-time great Wayne Gretzky on the Los Angeles Kings. The following season (1995-96) Grant Fuhr inked a free agent contract with the St. Louis Blues, expected to serve primarily as a mentor for the club’s young and inexperienced goaltenders. Instead, the veteran turned in another one of his more durable and inspiring performances in NHL history by playing in a league-record 79 games, 75 of them consecutively, also an NHL record. His leadership and clutch play guided the Blues into the postseason before a knee injury ended both his and the team’s season. Grant Fuhr returned to the Blues the following season and once again turned in sterling goaltending duties but injuries to other key players prevented the team from making the playoffs. On September 4, 1999 Grant Fuhr was once again traded, this time joining one of Edmonton’s hated arch-rivals Calgary Flames. As in previous stops, he served unselfishly as a mentor to several of Calgary’s up-and-coming young goaltenders, specifically Fred Braithwaite. With the Flames, Grant Fuhr joined an elite club on Oct. 22, 1999 when he was in goal against the Florida Panthers for his 400th victory, joining such legends as Tony Esposito, Glenn Hall, Jacques Plante, Patrick Roy and Terry Sawchuk as the only goaltenders in NHL history to reach the 400-win mark. consideration for eligibility, Grant Fuhr was awarded the game’s highest honor when he was inducted into the exclusive Hockey Hall of Fame. Following his retirement, Grant Fuhr remained involved in hockey, serving as goaltending coach with Calgary from 2000 through 2002 before once again rejoining former teammate and then-Phoenix Coyote owner Wayne Gretzky in the same coaching position, mentoring young goaltending hopefuls, a post he held from 2004 through 2009. With the almost unfair amount of offensive firepower (Gretzky, Messier, Kurri, etc.) 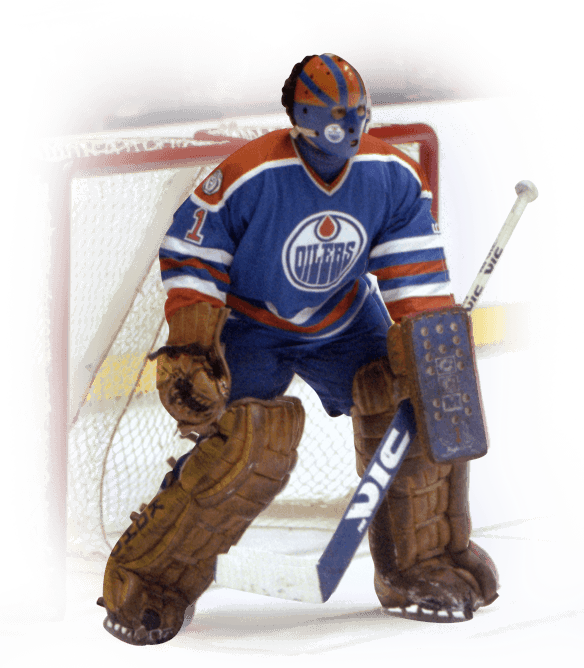 contained on the Edmonton Oilers squad during the dynasty years, it’s natural to assume that all head coach Glen Sather needed in goal was a warm body. However, with so much emphasis placed on offense, Edmonton’s defense left quite a bit to be desired, placing added pressure on Grant Fuhr. Although his goals allowed percentage and shutouts were never to be found among the league leaders, his tenacity and clutch play, especially in the playoffs, were unmatched and it’s difficult to imagine any other goaltender having the success rate that Grant Fuhr had over a ten-year period. The “Great One” himself, Wayne Gretzky, is on record as calling Grant Fuhr “the best goaltender in NHL history.” Fuhr’s five Stanley Cup championships and six All-Star Game appearances are evidence enough to support Gretzky’s statement.